Detroit-born poker pro David Olson flew into Las Vegas with one thing on his mind: playing the Event #51 Monster (stack) tournament. But at the last minute, some of his friends talked him into playing the Event #52 $10,000 Limit Hold’em tourney as well. Olson can definitely thank his friends now after beating a 122-player field in this event to win his first gold bracelet and $303,909. Few would have picked the 27-year-old to win when final table play began. After all, he wasn’t one of the biggest stacks or better-known names among the final nine players. However, he remained alive and finally seized the chip lead during three-handed play, never looking back after this. Another player whose good fortunes at the 2014 WSOP were tied to the Monster tournament is Haixia Zhang. She was among the 7,862 players to take part in the Monster, only to bust out on the first day after having a nightmare run. So Zhang made an unplanned decision to enter the Ladies Championship tourney while hoping for some redemption. She got more than just redemption after topping a 793-player field to win this event and $153,470. The California business owner and amateur poker player couldn’t believe her victory in the aftermath. “I’m in complete awe,” Zhang said. “It’s unreal. 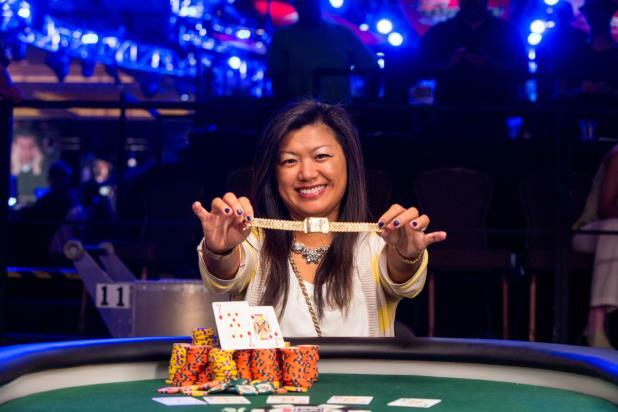 I’m just glad to be here, let alone win it.” With only some small cashes to her name, it’s easy to see why Zhang can’t believe that she’s a WSOP champion. Add in the fact that she was down to just four big blinds at one point in the tourney, and it’s even more incredible that she came back to claim victory. Zhang owns a staffing agency in California and dedicates the bulk of her time to this business and her family. So it’s doubtful that the married mother of two will be embarking on a serious poker career any time soon. However, Zhang did say that she’ll definitely be back next year for the Ladies Championship. With over $2 million in winnings, Florian Langmann has definitely had some success on the live tournament circuit. However, the large majority of his accomplishments have come in Europe, including a 2007 EPT London runner-up finish ($693,625), a 2009 EPT Monte Carlo High Roller fourth-place finish ($247,193) and several side event victories. But now, the German poker pro can boast of having success at the WSOP too since he won the Event #54 $3,000 PLO Hi-Lo tournament. Langmann battled through a field of 474 entrants to win this tourney and $297,650. He was one of the middle stacks with 20 players left in the event. But by the time the nine-player final table started, he’d built a large chip lead. This lead gave Langmann the advantage and confidence that he needed to win his first major tournament on US soil. Interestingly enough, he doesn’t really play PLO Hi-Lo too often. However, Langmann decided to take a shot at the $3k tournament anyways, which resulted in the fifth WSOP victory for Germans this year, which ranks second only to the US. The other four gold bracelets are split between George Danzer and Dominik Nitsche.